← Talking politics is not a crime! 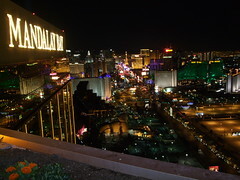 One of the best views of the Las Vegas Strip is from the Foundation Room high up at the Mandalay Bay in Las Vegas. There’s also a House of Blues restaurant below, but the Foundation Room is different. Not sure if this is only reserved for special events or not, but it sure was a great view. Ah “The Strip”… there is magic in those words. Unfortunately it seems the effect of those words is decreasing. To the out-of-towners Vegas often means “The Strip” even though those bright lights now have pornslappers by the zillions. Consider the famed “House Edge”… its always the worst on the strip, it gets better Downtown and its best in the outlying “Locals” casinos. A trade show? Yeah…go to the Strip. Memories? Depends. Gamblers often head to the local casinos, but the trade shows, bars, night-clubs and tourists are all at the bright lights of the Strip. Yes. The house edge will be a bit worse for me on The Strip, the pace will be a good bit faster and so I will get a worse bargain on the strip than elsewhere… but its not just moths that have a fatal attraction for bright lights.